It was a surprise to see a number of Yahoo! patents listed in Google’s assignment database as having been assigned to Google. With news recently that Yahoo would be closing the Yahoo Directory, that seemed like a strategic choice. Now I’m wondering if we will ever see an independent Yahoo Search Engine ever again once their deal to have Microsoft supply search results to them ends. The USPTO assignment database doesn’t disclose financial details of transactions like this, so we don’t know things like how much the transaction cost or if there were licensing agreements accompanying the transaction. A number of these patents seem to have orginated at Yahoo!, but some were acquired by Yahoo when they acquired companies such as Altavista and Inktomi. Fastforward Technologies specialized in multi streaming broadcast technologies and was originally acquired by Inktomi. Does Yahoo! have a strategic relationship with Google now that former Google Employee Marissa Mayer is now their CEO? On Friday, Moneywatch asked, Is Yahoo’s Marissa Mayer running out of strategic room? and reminded us of rumors of a possible partnership with AOL. It looks like Yahoo may not have to work with AOL with other choices available. I’ve listed the patent filings that appear to have originated at Yahoo first, with additional information for some of the ones that caught my attention. We don’t know if Google has done any work on topics related to some of these, but some are really interesting. I’d especially like to see the “Tag-Maps” one developed. This looks like it includes a bundle of location based services and widgets involving businesses in specific locations that may reflect activities of the searcher, such as books purchased at a particular book store. It might be a nice addition to something like a local search service based upon user location. Systems and methods are provided for subscribing to podcast feeds from a single location. A server-based search engine is provided that identifies podcasts located throughout a network that are available to a user’s rendering device and presents the user with a user interface from which the user can search for podcasts, subscribe to an identified podcast, listen to an identified podcast, or obtain additional information related to an identified podcast. 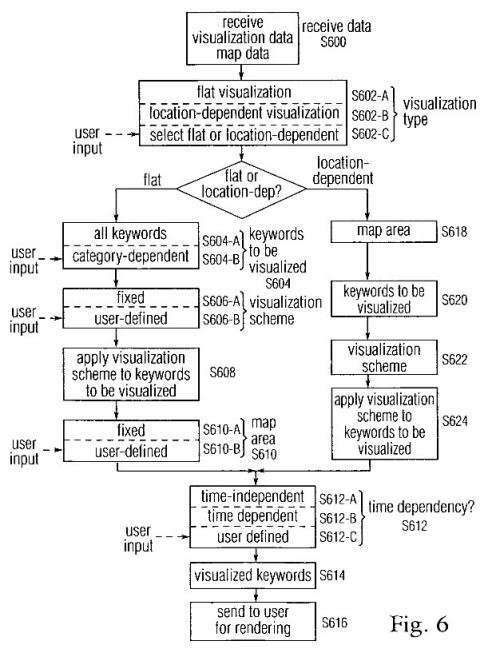 Co-invented by Mor Naaman, this can show a map with a keyword cloud on it showing locations associated with those keywords and other ranking signals such as “location, importance/relevance factors, time, visualization level, and keyword category.” I haven’t seen something like this released, and I’d really like to. It sounds like a nice way to find things. Imagine wondering around New York or San Francisco with something like this running; it would be like treasure hunting. Considering entering into a transaction of some type with someone else, and want to know how others felt about transacting with that person. This would be one way of finding out. Serving a set of search results returned by the search engine to a display device of the user. Involves grouping and showing off travel itineraries. I can’t recall if this is something Google can do well at this point. Does what it says in the title – tries to understand languages understood by someone sending a short message, based upon the message. Involves creating a media playing playlist for musical devices and set top boxes. Looks like it’s related to an “internet of things” patent that Yahoo published a few years ago. Describes a customizable Web portal. Looks at user behavior data from mobile users to make up for a scarcity of such information. Wow, there is a ton of tech in here for Google to go through. What stuck out for me was the mention of the podcast-related search engine + ‘Background Contextual Conversational Search’. Thanks for the great article, once again! Excuse my ignorance, but how did Google get these patents, did they buy them or what? What does “assigned” mean in this case? When an inventor transfers over his or her legal rights under a patent to a company they work for, or to a company who has purchased those legal rights, the action of transferring those rights is called an “assignment.” It’s something that is usually recorded at the patent office. When Yahoo assigns a patent to Google, It is passing over legal rights in the patents to Google. This kind of thing often happens in exchange for money, but could also happen in exchange for some other kind of consideration, such as a promise to do something or not to do something. It’s most likely that currency exchanged hands. While a number of these patents are older, they still can be powerful as protection from others. Many of the patents are newer as well, and the inventions within them could be pursued further. I listed a number of them that I found interesting, but there are some others that could be used as well. I’d really like to see a podcast search engine. I think Google’s conversational search (Hummingbird) is better than this one from Yahoo, but this one might have some elements that one could help with, such as the idea of looking for very timely and topical subjects to provide context for such queries. hello Bill Slawski…. fantastic information. we realized several things through your article.. Appreciate it. Re itineraries – maybe something they might use in connection with their flight search (+ITA Matrix) and their hotel search. Yahoo seems to be on a downward spiral as far as search engine is concerned. they have started winding up their operations in India as well. Thanks for the article. Iâ€™d really like to see a podcast search engine..maybe something they might use in connection with their flight search.they have started winding up their operations in India as well. Thank to u for the article. Let it be a lesson. Yahoo had a 1st mover advantage in the search game, but made bad calculated decisions. I think this is the beginning of the end for Yahoo. They should have taken that $50 billion dollar price tag from Microsoft a couple of years again.